What could be more fun? What could be easier for Mom? Kickin' Martial Arts Birthday Party! This year, try something different for your Child's Birthday. 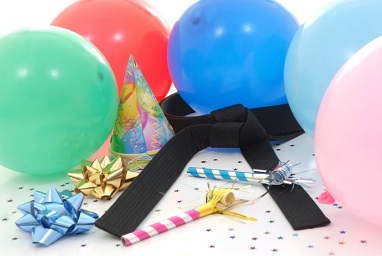 Try Tran's Martial Arts and Fitness Center's Martial Arts Birthday Parties. At Tran's Kickin' Birthday Parties your child and friends not only get a great party but they get a workout and learn about martial arts while they have a blast! During the party children will develop a feel for the total fitness, self confidence and discipline that Martial Arts can provide. Call Tran's Martial Arts And Fitness In Boulder Today And Make Your Child's Net Birthday One To Remember! It's not just great for the kids; we provide a care-free party that gives the parents a chance to relax and enjoy the day with their child. This place has changed my whole life for the better in a way I just can't put down in words. I was about 12 years old when I joined, and this Martial Arts school has helped lay the most stable foundations of my life now; honor, respect, kindness, faith, honesty, diligence, thoughtfulness, self discipline, and the ability to free my mind and body of stress when needed. If I hadn't been living so far away and moving around so often, I would have never left this school. I intend to re-join as soon as I possibly can. I've always thought to myself, "when I have kids, I want to send them to this school so they can learn the values I learned. Great staff! Excellent curriculum. This school is great for adults and children. To the pregnant lady and idiot husband (1-star review) that were mad at the Fitness Center because they were told it was safe to practice Muay Thai. Seriously, you need a doctor to tell you that you shouldn't be kicked in the belly? Come on, I'm sure the Tran's staff said you can workout and they'll make sure you don't go anywhere near any sparring or the like. Your MD naturally hears kick boxing and panics, of course he does since you left out what actually is involved during a training session. Good thing you didn't sue them? Another stupid comment? They should start locking up door knobs like you that threaten lawsuits for idiotic things. I bet you'd sue a fast food restaurant for serving coffee too hot (read the label!). Good thing for those commercials that have to read off a huge legal statement or they'd get sued by you because you really believed you can make millions at home on the internet by working only 2 hours a day. In sum, go give Tran's a try, they are really great people. They'll take care of you. Tran's Muay Thai is an awesome place to go to get in shape, continue to practice martial arts, or to just learn something new and exciting! This place feels like my home away from home. Everyone is very welcoming and fully support each other in class and/or outside of it. There is always something going on and everyone finds their little niche within the school! Thank you to all the instructors and fellow students for making this place excellent.